Source: Oxfam Charity Bookshop, Salisbury. First Sentence: The harsh clang of the meetinghouse bell shattered the peace of the night. Review Quote: The author of Orchard of Hope and Summer of Joy offers a glimpse of a bygone era in which the Shakers lived together in chastity and faith. With an appealing heroine and an intriguing plot, Gabhart’s latest novel deserves a place in all public libraries. – Library Journal Review for The Outsider, June 1, 2008. My Opinion: An unlikely Love and unwanted gift threaten to destroy a quiet Shaker girl of the 1800s. This was an ok read but not quite what I had expected, I had been hoping to learn more about the religion and how they live. My sympathies were with Gabrielle and her confusion over life in the outside world. Basically it is just a love story conducted under very restricting circumstances. If you want to learn more about the Shaker way of life maybe this is a good series to read as this is the first in the Shaker series. Ann H. Gabhart was born in Lawrenceburg, Kentucky, USA and grew up on a farm there. By the time she was ten she knew she wanted to be a writer. She's published over twenty novels. She and her husband have three children and nine grandchildren. She still lives on a farm not far from where she grew up. She loves playing with her grandkids, walking with her dog, reading and, of course, writing. Her Shaker books, set in her fictional Shaker village of Harmony Hill in the 1800's, are popular with readers. 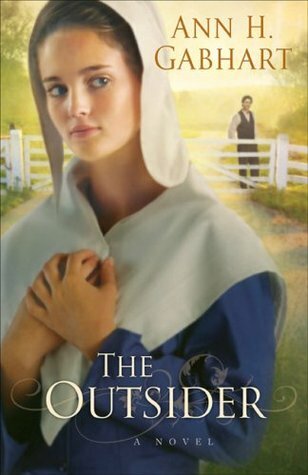 The Outsider was a Christian Fiction Book Award Finalist in 2009.